Often overlooked as a form of serious music, the film score is perhaps the single locale where the masses are still commonly exposed to symphonic music with any regularity. Consider for just a moment how many people can instantly recognize the themes from Star Wars, Superman or Jaws. Now compare that to any work outside of Beethoven�s Fifth Symphony. In the general populace, Philip Glass�s work for The Truman Show or The Hours is infinitely more familiar than Einstein on the Beach. Thus with the Film Music Classics series, it seems that Naxos has hit upon an idea that should be applauded. Taking the film work of serious composers and presenting it as serious music, equivalent to ballet scores and theatrical music is an idea that should be embraced. With the work of Arthur Honegger, Naxos has made a fine selection. Like Glass, Honegger is nothing akin to a one-trick pony. He was one of the preeminent composers living in France in the 1920s. His work outside film consisted of operas, oratorios, five symphonies, chamber music, ballet scores, incidental music and popular songs. He was connected to the musical innovations of France, Germany and Switzerland throughout his life, and his musical ideas are still quite influential. This is true even in the realm of film scores. Honegger�s opinion was that cinematic music was distinct from pure musical composition in that it relies on contrasts rather than continuity and logical development. Therefore the music and sound is relied upon to adapt and support the visual elements. It becomes unified with the screen, where the musical message is conveyed visually. Thus it is a different Honegger that the listener encounters with his film scores than one more intimately familiar from his other works. Throughout the hour of music here, he shifts rapidly from one musical thought to another. In some of the tracks he juxtaposes elements of cabaret music with more romantic material. The results are never jarring, and often quite interesting. If one is familiar with the film itself, there are perhaps a few surprises here. Three dance pieces were removed, because they were composed by someone else. Also removed was some of the prelude for organ and a few bits of introductory or transition material. It is considered the complete film score, according to the insert, because the omitted material either was not composed by Honegger or because the cues were crossed out in the original manuscript, presumably by the composer himself. Also missing is Gavroche�s death scene which requires a singing voice accompanied by a few instruments, presumably because the singer changes the character of what is here considered the film score. Additionally there is material originally composed but not used in the film for editing reasons. This material, such as the Cosette et Marius episode serves well to make this a more complete musical work. Indeed, subscribing too closely to a picture that cannot be seen by the listener would have likely produced a stilted recording that would not be nearly as enjoyable to listen to. For those for whom Les Miserabl�s means only the musical version by Boublil and Sch�nberg, this is not the musical. Les Mis�rables was filmed several times previous to that incarnation. 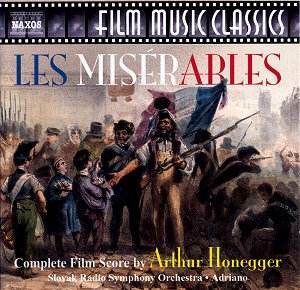 The movie version that this score was attached to was Raymond Bernard�s black and white rendering starring Harry Baur as Jean Valjean. It is intended to convey a passionate and powerful atmosphere. Broadly speaking, it succeeds. It seems evident that this was more than simply a financial venture for Honegger. He later arranged the work into a musical suite intended to stand alone. This does lead to the question �What does this actually sound like?� The instrumentation is somewhat non-standard in that it is scored for a symphony orchestra including saxophone, piano, harp and percussion but omitting the double-basses. It is tied together throughout by three leitmotifs used throughout the score. There is the resigned march of the convicts, the ascending and inspirational Jean Valjean theme, and the love theme for Cosette and Marius. This use of theme nicely gives a pacing and structure to the otherwise disjointed material. Aside from the rather refined waltz from the Musique chez Gillenormand cue, performed by a chamber-sized group rather than the full orchestra, the music is reminiscent of the work of the German Romantics. It is dramatic, lyrical, utterly tonal and familiar, without straying into the pedantic or hackneyed. The performing group gives the work admirable attention. However it would be difficult to call the direction inspired. Through the more impassioned strains, it does feel that the conductor, Adriano, could pull more emotion out of his performers. However, as there are no other complete recordings aside from the film itself to compare this work with, one must concede that it is possible that he is attempting too closely to follow the original, which had the advantage of the visual imagery. While there are several fine moments throughout, there are places where the music seems to sag emotionally where it should not. The booklet does not suffer from the same lack of intensity. It does a marvelous job of discussing the features of the film and details the history of the film, composer, and score. Perhaps this is Adriano�s stronger suit, as he is the writer that gives such a convincing and impassioned argument that this is a worthy work, and that the entire genre of classic movie scores should be given more than an occasional and cursory recording. Although this recording is not perfect, this reviewer is inclined to agree with Adriano. This is certainly unmined gold. It will hopefully be given more future consideration for recording. It certainly is a solid work that will, I hope, enjoy enough success to encourage more recordings of this kind.